Well, what a night. Everything went right for England as they #unleashedfierce as they had promised to do. 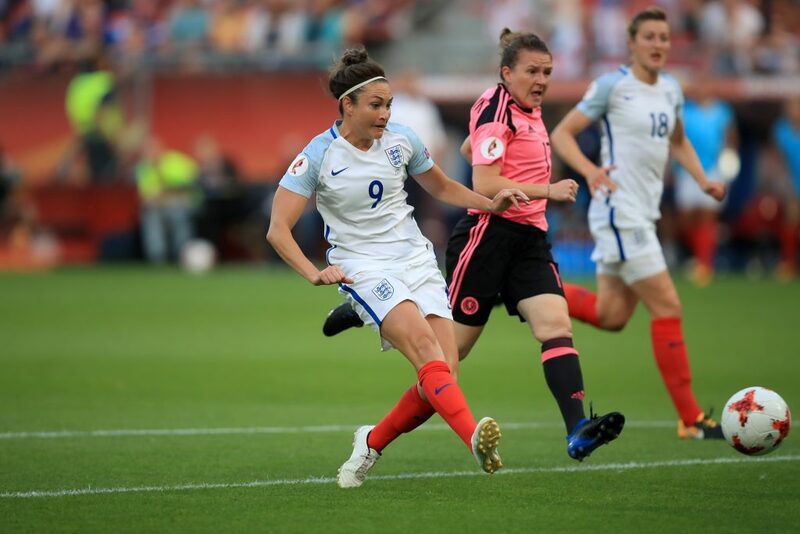 The urgency to start fast and get the early goal paid dividends and once Jodie Taylor had added the second of her historic hat-trick the result never seemed in doubt and it looked bleak for a Scottish side that just can’t seem to catch a break in terms of their luck in recent months. We just learn from this and work on our resilience and come back. It’s not over for us. We came here as a team. We have had some losses on the way here in terms of personnel but we are playing as a team and losing as a team and we are rising again because in three days time we play Portugal and that’s the main focus now. Unfortunately, I think that we maybe let another player today, in Jane Ross, who was one of our best players on the pitch. Although we don’t know that yet, they are off to hospital. So that was tough. It’s her shoulder and she can’t really move it. She played on after the tackle but it didn’t improve. No. I just think it’s difficult when you lose such an early goal and then lose another goal again, so it was 3-0 at half time. That’s tough. We just need to pick ourselves up from this. I think it was a big occasion for many players on the pitch. I think that showed maybe. You learn from it, that’s what we do all the time, that’s how we’ve worked all of these years. We learn and go on and rise again, that’s what Scotland stands for. 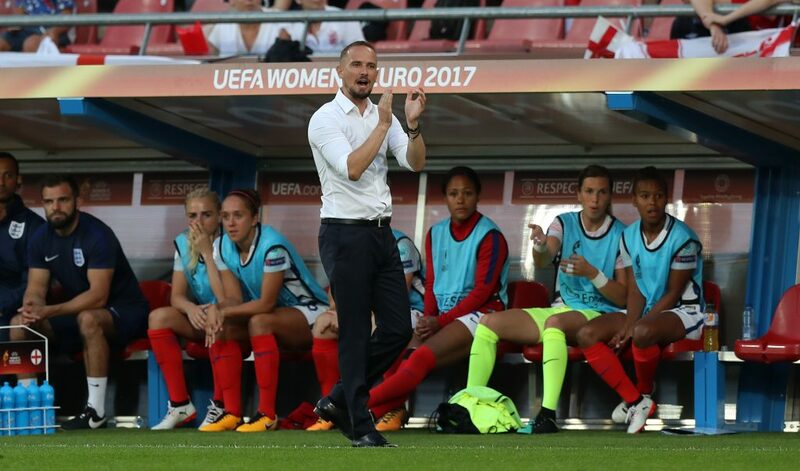 England’s Jodie Taylor scores her side’s first goal of the game during the UEFA Women’s Euro 2017, Group D match at Stadion Galgenwaard, Utrecht. I wasn’t aware that no-one had ever scored a hat-trick at a major tournament but I’m just with the performance and winning 5-0. Or 6-0? Was it 6-0? 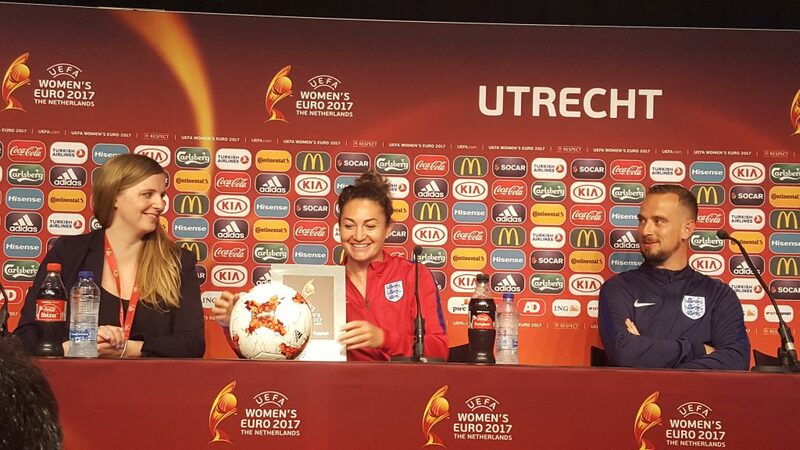 [‘You were warming down at that point,’ interjects Mark Sampson] But I’m just pleased with a solid performance and three points on the board. Yeah this is it. One of our staff members tracked it down. It isn’t been signed yet but I’ll get all of the girls to sign it. Yeah I’m happy to have got on to score three goals but again I wouldn’t be able to score if I didn’t get the service so credit to everyone else. Maybe we worked on that a little bit. In all fairness, I didn’t see it come through, I wasn’t expecting her to dummy it at all. I just kind of popped through, wasn’t sure if I was offside, and was through on goal. No, I mean, of course you want to play as many minutes as you can, but it’s a long tournament ahead. I’ll take a hat-trick after 60 minutes! Just grateful to get on and score and for the girls to do well, so, happy. Yeah, I think it was coming together. We’ve got a lot of quality and different strengths and options across the team; we’re not just a one-trick pony, hopefully as we’ve shown tonight. If there’s space down the sides, we’ll play down the sides, and I think we’ve really grown at recognising what’s on, with quality players who can really bring their game and do all of that. Even in the circle at the end on the pitch it’s spoken about. Everyone knows; it’s a really experienced group and many of us have been together through ups and downs. We know obviously not to get ahead of ourselves but we’re happy with the performance. Yeah, it does, yeah. I think certainly the last goal was more of a signature finish that I’ve had through most of my career and the Holland goal (in the 1-0 friendly win in November) was very similar as well. It’s just nice to get fit and playing; the medical staff have been phenomenal. I can’t complain, everyone’s had a lot of belief in me and trust, so yeah, I’m happy. No, no! That’ll be a memorable thing for my trophy stand one day when I’m actually settled somewhere. My mum and dad and my partner were here, and they’ll be coming and going. That’s the joy of being so close to England; obviously Canada was tough (in the 2015 World Cup). My sisters, cousins, auntie, they’re going to come out, and I’ve got a couple of friends coming out over the weekend when they’ve got a bit of time off, so it’ll be nice. We’re really pleased with the performance and the result. Big respect to Scotland who gave us some problems, particularly in the first 20 minutes or so with their physicality and set pieces. They will bounce back and it wouldn’t surprise me if they ended up coming through this group. But from our point of view, to score six goals and keep a clean sheet, is obviously very pleasing. We saw the work the players have put in prior to this event, in every area. The most important part for me was to see them thriving under such difficult and pressurised conditions. They’ve found a way now to enjoy these situations. We’ll enjoy tonight, go home happy, spend some time with friends and family, whatever time it is now! We’ll review today tomorrow and get our heads around Spain, for a difficult game and we need to be ready for that challenge on Sunday. Jordan has been playing well for us. She’s an excellent young player but I thought the team were outstanding tonight. As Jodie said, if you’re a forward player you’re relying on people getting the ball back and putting through the passes at the right time and at the right speed and I thought overall the team were very efficient. From back to front. Defensively we looked strong and were only really treated from set piece situations but I felt we handled them incredibly well, particularly Karen Bardsley. And with the ball, like I said, we were very efficient. Every chance we created normally ended with a shot on goal or we picked the right pass but didn’t quite finish it. We were really pleased with the team and the finishers too: Carney, Duggan and Parris. Parris with her tournament debut showed great maturity, Carney delivered a great ball for Jordan’s goal and Duggan to get off the mark at a major championship, it’s something she really deserves after a great amount of work, particularly in the last six months, to really grow as a person and a player. She’s a world class player, simple as that. I’ve not seen better in the game at anticipating passes in behind, moving into positions to receive the ball and of course it is dependent on the service but what Jodie has found over the past 12 months in particular is the ability to be an instinctive finisher. They are difficult traits to defend. If you’ve got someone who can play off your back shoulder, get to the ball first and shoot before you get back you’ve got some problems. So it’s a great start for Jodie and she should take some huge credit for her performance tonight. We’ve always had great faith in her and she does a great job for us when called upon to be the number nine. England’s Millie Bright is all smiles before kick off. Yeah, I think as a defender, and as a team we always say that a clean sheet is what we aim for. I think that’s important in tournament football, so yeah, I think it’s easy to switch off when you’re 5-0 up, 6-0 up, but I think we did well staying switched on and just keeping it locked out at the back. 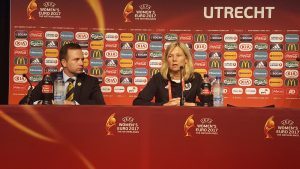 I think you have to take into account any possibility of which players will play against us, so we prepared for all really. Ultimately, it’s just to defend one-v-one battles and make sure we win them, no matter who it is. I think when we were walking out under the tunnel, that’s when it hit me that, ‘Right, Mill, you’re here now. Your first major tournament.’ I was quite composed; I just keep focused on my roles and responsibilities. Ultimately, our objective is just as a team to win, so I just keep focused on that and then hopefully it’ll just keep flowing.